Used between the luggage rack and the surface of the vehicle roof to minimize friction, scratching, squeaking and rattling. 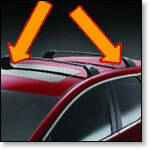 Self adhered roof rack gasket tape with an easy to peel liner that is cast onto the foam rather than the adhesive. Simply unwind to expose the adhesive side and apply gentle pressure to stick. Acrylic adhesive can take up to 72 hours to achieve maximum bonding.